This ad is hanging on the wall of my prodominately pink bathroom. I don’t hate pink by any means, but I was a bit set off at the bathroom. It is tiled mostly pink with a bit of black. Placed there, I believe, when the building was built in 264BC. This lady is obviously feminine, for she chose the most feminine color of shampoos. I assume then that Selsun Blue must be for men. Here is all that jazz at the bottom in larger print for you old folks who remember this ad when it was in your McCalls circa 1969. I am indeed a girl. So yes, I must find this. My hair will exude wealth and he’ll notice the pink. It’s a win-win. This entry was posted in Blogroll, entertainment, family, funner, happiness, health, home, how to, Life and tagged advertisements, pink, shampoo. Bookmark the permalink. i’m afraid to ask…what is a “pink” fragrance? Amy- I think it’s the same as pink otter pops…groan, that was cheesy. She’s so modern, she’s got a phone in the bathroom, but she’s still taking a bath in a barrel. That’s odd. I like her hair though. That picture reminds me of Petticoat Junction. taoist- yes. lileks is my hero. Wow, that is a touch tone phone too. “….your whole head becomes one great swirl of whipped-cream lather.” Wow, advertisements have come a long way. Two wows in on reply. That’s the sign of a great post. So…apparently I have a dirty mind. 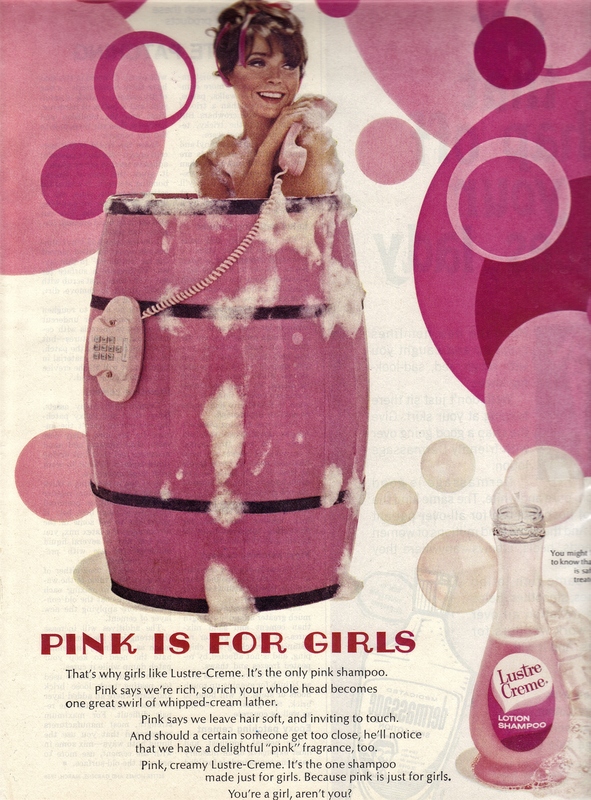 I look at the picture and I see LUST-re Creme, and Pink is for Girls…and I’m trying to figure out when Lesbians go their own line of shampoo (not that I object to that). taoist- I have been reading him since I moved back here in ’04, he is in my top 3 favorite writers of all time. I basically want to be him. Ohh, I see the pix now. how blinking cyoot! My shampoo is green so I guess I’m a raging environmentalist. Ha ha ha ha ha–I cracked myself up. Have a great 4th Kris! I’m starting to move up slowly on Mob Wars–I’ll work on it more this weekend. Pink is wonderful. You might like my newest blog, http://savethepinkbathrooms.com .